If you visit Chevrolet.com right now, the top banner reads, "The 2014 Corvette Stingray Has Arrived To Defy Convention." Click into the site, and you see "Enemy of the Same" in big block letters over a backdrop of the new Stingray lurking in the shadows, angrily peering at you with it's new "L" shaped headlights. The 'Vette is, and always has been about the impression. The impression it makes when you see it, the impression it makes when you get behind the wheel, and the impression it makes on everybody else as you roll by. But to the promotional team at Chevy, there's the one impression that matter above all: how you react and feel, when you see the Corvette in an advertisement. Today, most ads are in the form of online drop-downs, television commercials, and sporting event displays. Although print still exists, the ads you'd seen on physical paper used to be the main source to get all eyes on a new car. And they weren't like something you'd see today with three or four humongous words and direct shots at competitors. They had paragraphs, explaining why and how the Corvette was the best car in the world. 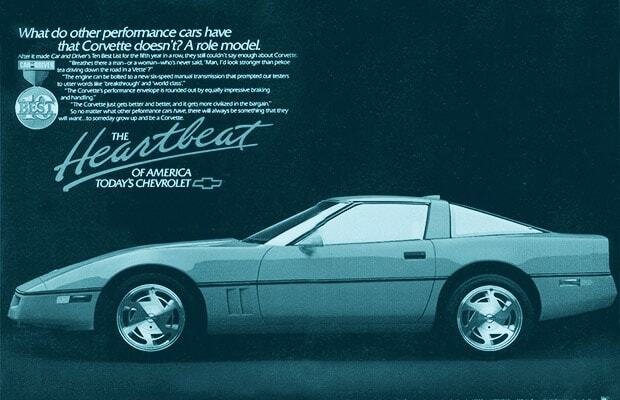 Take a trip down a historical road with us, as we remember The 25 Most Iconic Chevrolet Corvette Advertisements.